BACKGROUND AND PURPOSE: Patients with stroke unsuitable for IV thrombolysis may be considered for endovascular revascularization, particularly when baseline imaging suggests proximal cerebral vessel occlusion associated with minimal established infarction. This retrospective review describes the use of a self-expanding retrievable intracranial stent (Solitaire AB) for thrombectomy in acute ischemic stroke. MATERIALS AND METHODS: Twenty-six consecutive patients with stroke treated endovascularly by using the Solitaire stent were identified, followed by detailed review of data extracted from their imaging and clinical records. RESULTS: Recanalization (TIMI grade ≥2) was achieved with Solitaire thrombectomy as the single treatment technique in 16 patients and in combination with urokinase or the Penumbra device in 9 of the remaining 10 patients. Two patients had symptomatic intracranial hemorrhage. A favorable clinical outcome (mRS score of ≤2) was seen in 3 of 5 patients with MCA occlusion, 6 of 11 (55%) patients with ICA occlusion, and 2 of 10 patients with BA occlusion. CONCLUSIONS: Mechanical thrombectomy by using the Solitaire stent appears to be safe and is capable of achieving a high rate of recanalization and favorable clinical outcomes in patients presenting with proximal cerebral vessel occlusion. The clinical impact of salvaging potentially viable brain in acute ischemic stroke continues to drive the quest for increasingly more effective revascularization strategies. Mechanical revascularization holds great promise but remains yet to be proved as the preferred approach in managing acute stroke. Patient selection, type of device, and technique add to the complexity of demonstrating its place in stroke therapy. Mechanical revascularization through our service has largely been limited to patients deemed unsuitable for IV rtPA, showing proximal cerebral vessel occlusion and minimal established infarction on baseline imaging. We currently favor the self-expanding retrievable intracranial stent (Solitaire AB; ev3, Irvine, California) as the initial device used in all patients satisfying these 3 criteria. To our knowledge, there is limited published literature about the use of this stent for revascularization, though it is already marketed for the treatment of acute ischemic stroke (Solitaire FR) and is currently under prospective investigation as part of the SOLITAIRE FR With the Intention For Thrombectomy Study (http://clinicaltrials.gov/ct2/show/NCT01054560). Our study aimed to retrospectively assess the efficacy and safety of Solitaire-assisted thrombectomy in patients with acute stroke treated by our interventional neuroradiology service. This retrospective study had institutional ethics committee approval. 3) Their noninvasive angiographic imaging confirmed persistent proximal cerebral vessel occlusion. This involved the ICA, MCA mainstem or bifurcation, or the BA. 4) They had established infarction within the anterior circulation affecting less than one-third of their MCA territory. This was most often based on CTP (cerebral blood volume) lesion size and, for study purposes, was further quantified in retrospect according to the ASPECT score.3 Ischemia within the posterior circulation was not quantified according to any formal scale but also showed no or very little established infarction, usually assessed by MR imaging. Only patients treated by Solitaire thrombectomy were considered, with analysis primarily focused on those managed with the Solitaire stent as the single treatment technique used. There were slight variations in the use of the stent, but the 4 interventionalists conformed to a general protocol. All patients were treated under general anesthesia. A balloon-guided catheter (6F-9F) was used in patients with anterior circulation occlusion and an ordinary guide catheter (6F) in posterior circulation occlusion. Using a coaxial system, we advanced a Rebar-18 microcatheter (ev3) for the 4-mm Solitaire stent or a Rebar-27 microcatheter for the 6-mm Solitaire stent over a Transend EX 0.014 floppy guidewire (Boston Scientific, Fremont, California) placed through the thrombus. Microcatheter positioning 1 cm distal to the thrombus was confirmed by contrast injection. The stent was then advanced to the distal tip of the microcatheter. Unsheathing resulted in half of the stent being deployed distal to the thrombus, half of the stent being deployed within the thrombus, and the distal marker of the microcatheter being aligned with the proximal marker of the stent. The unsheathed Solitaire stent and Rebar microcatheter were then removed as a system into the guide catheter, while applying suction through the guide catheter. Angiographic runs were repeated to assess revascularization, distal emboli, and vessel injury. The entire process was repeated until recanalization was achieved, defined by contrast flow past the initial occlusion along with complete or near-complete anterograde distal branch filling (TIMI grade, ≥2).4 The number of device passes was not restricted for the proximal vessel clearance (proximal to M3 of the MCA, A2 of the ACA, or P2 of the posterior cerebral artery). Thrombectomy of residual distal branch occlusions was undertaken, when required, by using the Penumbra device (Penumbra, Alameda, California). IA urokinase was used where vessel tortuosity prevented withdrawal of the fully deployed stent. Most notable, all patients with tandem carotid lesions were treated by angioplasty and stent placement of the proximal lesion. Carotid stent placement was accompanied by an IV bolus administration of abciximab, 0.125 mg/kg (half the recommended loading dose), as well as nasogastric administration of aspirin, 300 mg, and clopidogrel, 300 mg. Abciximab was not given to patients in whom urokinase was used. Patients who did not require permanent stent deployment did not receive anticoagulation or antiplatelet medications during the thrombectomy or during the first 24 hours following the thrombectomy. Clinical presentations were subdivided according to the Oxfordshire Community Stroke Project classification.5 The NIHSS score was deduced from the examinations recorded at presentation and at the time of final assessment.6 Comatose patients (due to the cerebral ischemia alone or having been intubated and anesthetized before arrival) were assigned an NIHSS score of 35. Stroke mechanism was based on the Trial of Org 10172 in Acute Stroke Treatment stroke subtype classification, including large-artery atherosclerosis, cardioembolism, other determined etiology, or other undetermined etiology.7 The reason for using IA rather than IV therapy was also ascertained mainly on the basis of contraindications for IA thrombolysis.1 This included delayed presentation in which initiation of rtPA could not be commenced within 3 hours of symptom onset. Functional outcomes using the mRS were estimated from the last documented clinical assessment, which occurred at discharge or as an outpatient follow-up at 3 months.8 Complications were recorded with regard to using the Solitaire stent as well as intracranial hemorrhage of any cause associated with a poor clinical outcome (mRS score, ≥ 2). All patients were treated by using the Solitaire AB neurovascular remodeling device in an off-label indication of thrombectomy in acute stroke. The Solitaire AB stent was originally developed for stent-assisted cerebral aneurysm coiling and is unique in being retrievable following full deployment of the undetached stent.9 It is a nitinol stent with a closed-cell design and is slit along its long axis to allow overlap for assuring cell stability in smaller diameter vessels. Two stent diameters are available, the 4- and 6-mm sizes, allowing delivery through a 0.021-inch or 0.027-inch (inner lumen) microcatheter, respectively. The stent wall is 50–70 μm thick, delivering a radial force per unit length of 0.011 N/mm when deployed in an appropriately sized vessel. In this study, we included 26 of 28 consecutive patients with acute stroke treated by endovascular means during a 12-month period starting in April 2009. Sixteen of these 26 patients were treated by using the Solitaire stent alone, and the remaining 10 patients were treated by using a combination of modalities, including the Solitaire stent. One of the 2 excluded patients was treated with the Penumbra device alone and the other, with urokinase alone. Results for the 26 patients having undergone Solitaire thrombectomy are summarized in On-line Tables 1 and 2. Technical difficulties and procedure-related complications associated with using the Solitaire stent, however, warrant further elaboration. Inadvertent stent detachment occurred in the MCA of patient 20 (On-line Tables 1 and 2) when we applied traction during the second pass. The patient had tortuous vessels and large thrombus burden within the ICA and MCA. Recanalization was achieved with IA urokinase in this patient. In a similar case with vessel tortuosity, patient 23, the stent had to be partially resheathed to allow removal from the MCA, and urokinase again helped to achieve a good radiologic result. Acute common carotid bifurcation stent placement followed by distal Solitaire thrombectomy resulted in the devices becoming entangled in patient 2 when we withdrew them through the proximal carotid stent. This was managed by placing a third stent within the cervical carotid artery, thereby jailing the Solitaire stent against the carotid wall. The approach to tandem lesions therefore changed to stent placement after we completed the distal thrombectomy. There were no direct clinical sequelae consequent to these difficulties. Patient 21 with carotid terminus occlusion had an intracranial hemorrhage and eventually died following endovascular treatment using the Merci mechanical clot retriever (Concentric Medical, Mountain View, California) as well as the Solitaire stent. This was also the only patient in whom recanalization could not be achieved despite the attempted thrombectomy. Most notable, the patient had hemorrhagic transformation of the nearly complete hemispheric infarction, and in hindsight, the baseline noncontrast CT already showed significant established infarction. Perforation of the BA was seen in patient 26 during thrombectomy by using the Penumbra device. The Solitaire stent was then used to complete the thrombectomy and to stent across an apparent perforated basilar stenosis, thereby also arresting contrast leakage. This patient, however, had extensive posterior circulation infarction despite adequate recanalization. Thrombectomy in acute ischemic stroke by using the Solitaire stent is technically feasible, very promising, and already subject to a prospective study. This case series demonstrates how Solitaire thrombectomy achieves a high rate of recanalization, frequently translating into favorable outcomes for acute strokes caused by proximal occlusion within the cerebral circulation. 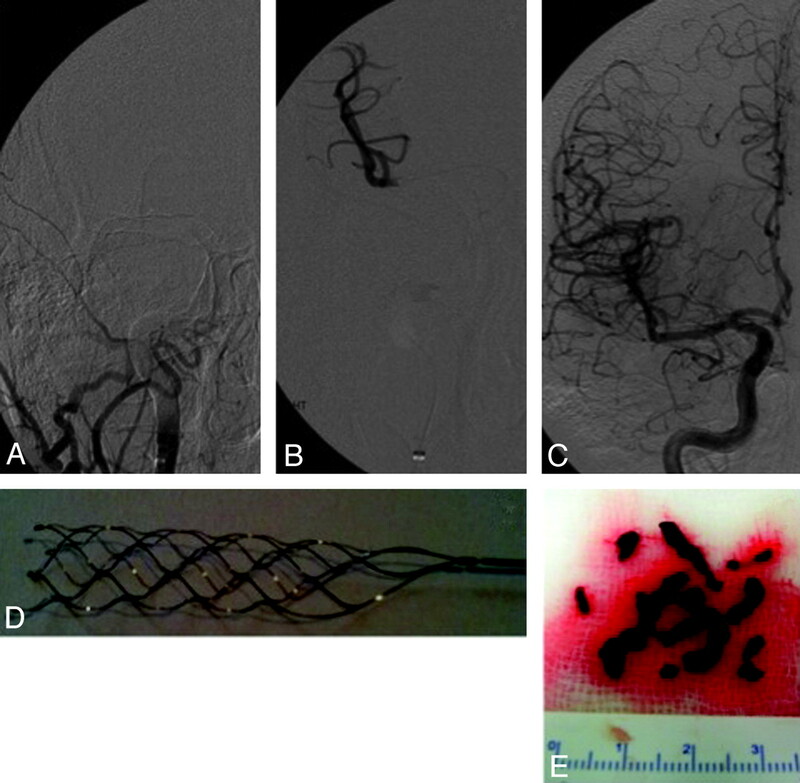 There is limited literature on stent-assisted recanalization in acute stroke, first reported as a bypass procedure by deploying a stent across the thrombus.10 These few reports also included the use of the Enterprise stent (Cordis, Miami Lakes, Florida), with the added benefit of being able to remove the partially deployed device once recanalization had been established.11,12 This approach was modified further, and a recent animal study (swine vessel occlusion model) reported using the fully retrievable Solitaire stent as a bypass and snare.13 Bypass is, however, not plausible when the thrombus length exceeds that of the stent, and we believe that it is the snare capability of this intracranial stent that sets it aside as a potentially highly effective device for acute stroke treatment. In our experience, the Solitaire stent could recanalize a long thrombosed arterial segment frequently within a single pass (Fig 1). Angiograms demonstrating ICA occlusion from the base of skull to the distal M1 MCA (A and B), full recanalization (C) following a single pass of the Solitaire AB stent (D), and extraction of a significant thrombus burden (E). In this series, recanalization was achieved in all 16 patients in whom the Solitaire stent was used as the single treatment technique. Recanalization was also achieved in 9 of 10 patients treated by Solitaire thrombectomy in combination with urokinase or the Penumbra device. The efficacy of Solitaire thrombectomy could, however, only be certain for those patients treated exclusively with this stent. When considering all 26 consecutive patients, Solitaire thrombectomy was thus responsible for recanalization in at least 16 of 26 (62%) patients. This is likely an underestimate of the efficacy of Solitaire thrombectomy but also evokes further consideration that combining modalities may eventually prove to be the most effective approach in acute stroke caused by proximal vessel occlusion. Twenty-one of the 26 patients had severe strokes caused by either acute ICA or BA occlusions. If we place this into further perspective, a large series demonstrated recanalization in only 7 of 32 (22%) ICA occlusions and 3 of 10 (30%) BA occlusions following IV thrombolysis.14 These figures suggest that Solitaire thrombectomy may be very effective in achieving recanalization in patients with such difficult-to-treat occlusions. Solitaire thrombectomy as a single treatment technique resulted in favorable clinical outcomes (mRS score, ≤ 2) in 5 of 8 (63%) patients with anterior circulation occlusions, and 2 of 8 (25%) patients with posterior circulation strokes. Most patients were assessed at the time of discharge rather than at 3-month follow-up, which may again have caused underestimation of its efficacy. The results, however, compared well with the outcomes recently reported by Castanõ et al15 in a prospective pilot study of Solitaire thrombectomy with subsequent favorable outcomes seen in 9 of 20 (45%) patients with acute anterior circulation occlusions. Selecting patients with apparent limited established infarction on baseline imaging almost certainly also influenced the outcomes.16 Nearly all anterior circulation strokes were retrospectively shown to have had an ASPECT score of ≥7 as an objective measure of limited infarction.17 This was contrasted with the poorer outcomes for BA occlusions, despite recanalization in these patients also thought to have had limited established infarction at baseline. Branch occlusions following recanalization of the primary occlusion were noted in patients 4, 17, and 24. These may have been primary or alternatively thrombectomy-associated embolic phenomena. They were cleared, and no new infarction was seen in the distribution of these branches on follow-up imaging. Several technical aspects about the use of Solitaire-assisted thrombectomy are also worth noting. First, although very trackable and easy to deliver, thrombus capture seemed to be reduced with vessel tortuosity. Elongation and deformation of the stent within a tortuous vessel could cause a spring-load effect that may allow the captured thrombus to escape, thus necessitating multiple passes. Partial resheathing of the stent to facilitate device removal decreases thrombus capture further but may be unavoidable to minimize the risk of vessel trauma or device fracture. Furthermore, changing the arterial branch of distal stent deployment has, in our experience, helped thrombus capture at bifurcations, such as changing to the contralateral P1 or a different M2 branch or the ACA instead of the MCA. This retrospective small case series does not allow drawing adequate conclusions but will help motivate further prospective study and, more important, will encourage sharing experiences that could influence patient selection, thrombectomy technique, and device improvements before undertaking a large acute stroke thrombectomy trial. Mechanical thrombectomy by using the Solitaire device seems to be effective in achieving safe recanalization and favorable clinical outcomes in patients presenting with proximal cerebral vessel occlusion and deserves further prospective study. Accepted after revision November 2, 2010. Mechanical thrombectomy with the Trevo ProVue device in ischemic stroke patients: does improved visibility translate into a clinical benefit? Double Solitaire Mechanical Thrombectomy in Acute Stroke: Effective Rescue Strategy for Refractory Artery Occlusions?